The medial collateral ligament (MCL) is the most commonly injured ligament of the knee*. The MCL primary function is to act as a valgus stabiliser of the knee and is most often injured when external rotational forces are applied to the lateral knee, such as a impact to the outside of the knee. A medial collateral ligament tear will typically occurs after trauma to the lateral aspect of the knee. The patient may report hearing a ‘pop’ with immediate medial joint line pain. Swelling tends to follow after a few hours (unless there is an associated haemarthrosis, in which case it will occur within minutes). The main clinical finding on examination will be increased laxity when testing the MCL*, via the valgus stress test. The patient will be extremely tender along the medial joint line, but may be able to weight bear. *A Grade II and III tear can be distinguished clinically on medial stress testing; Grade II is lax in 30 degrees of knee flexion but solid in full extension, whereas Grade III is lax in both these positions. In the acutely swollen knee following trauma, the main differentials to consider include fractures, meniscal injury, and collateral ligament tears. Any patient following trauma with significant knee pain and swelling should have a plain film radiograph to exclude any fracture. The gold-standard investigation to confirm the diagnosis for an MCL tear is via MRI scanning (Fig. 2), delineating the exact extent and grade of the tear. 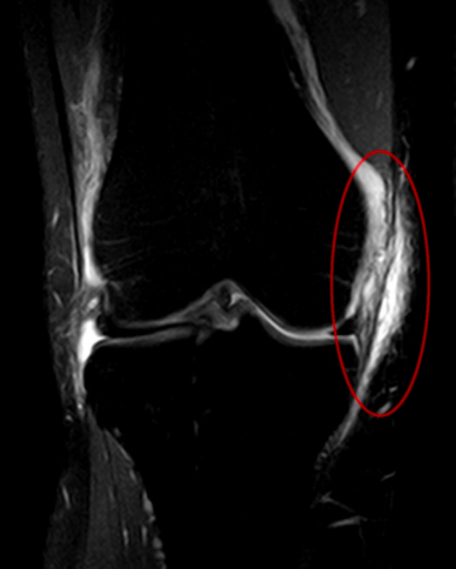 Figure 2 – A MCL tear, as seen on MRI (also in combination with ACL and medial meniscal damage). Grade I Injury: Rest, Ice, Compression, and Elevation (RICE) with analgesia (typically NSAIDs) as the mainstay. Strength training as tolerated should be incorporated, with an aim to return to full exercise within around 6 weeks. Grade III Injury: Analgesia with a knee brace and crutches, however any associated distal avulsion then surgery is considered. Patients should aim to be able to return to full exercise within around 12 weeks. The main complications following a MCL tear are instability in the joint and damage to the saphenous nerve. A medial collateral ligament tear most commonly occurs after to trauma to which aspect of the knee? Which of the following is an indication for surgery in medial collateral ligament injury? 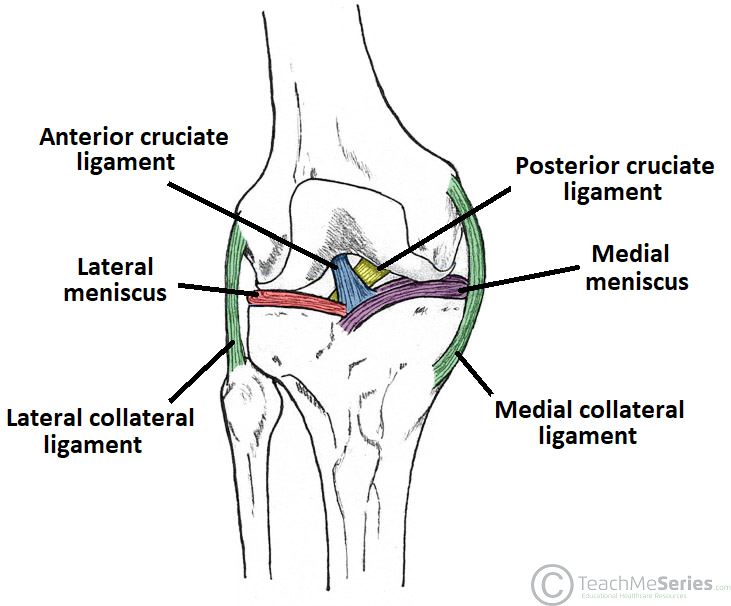 What is the characteristic feature of a medial collateral ligament tear?